Please note that our GLM aftermarket bellows kit includes P/N 21905 heavy duty gimbal bearing and P/N 86560 oil seal. Make sure to grease drive shaft when installing it through the gimbal bearing into the coupler. Be careful when sliding the shaft through the bellow so you don't tear or damage it. The new design has a cut out on each of the ribs which allows water to drain when tilted up, and helps alleviate some of the back pressure at idle speed. Install with holes facing down. Aligns engine and drive unit during installation. Alignment is required if new bearing is installed. 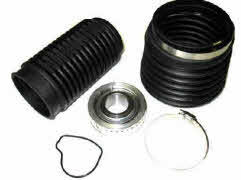 Includes gasket, 2o rings for drive shaft and seal. Gasket mounts between outdrive and transom housing. When installing, make sure to use gasket sealing compound on both sides.